We love Golden Retrievers and Yorkies as much as the next person, but there’s something special about rare dog breeds. Whether they were bred to herd mountain cattle like the Bergamasco Shepherd or pull sleds like the ultra-rare Chinook, these doggos are talented, surprising, and hard to find! We’ve pulled together a list of 21 rare dogs from across the globe. Did we miss your favorite rare dog breed? Let us know in the comments below! These doggos look like a mighty cross between a Bulldog and an American Staffordshire Terrier, but don’t let their tough exterior fool you — they’re loving family companions! The Alapaha Blueblood Bulldog likely descends from various Bulldog crosses, and the breed is also known as a Catahoula Bulldog. These large dogs are known for being protective, strong, and intelligent. While they can be big softies, an Alapaha Blueblood Bulldog needs plenty of exercise — they were bred to herd cattle and hogs. They love learning tricks and going on long jogs with their human! Think of the Alaskan Klee Kai as a miniature Husky! Originally bred in Alaska in the early 1970s, the Alaskan Klee Kai is energetic, intelligent, and playful. They’re not known to bark, and can be great family dogs if they’re raised with children who understand how to play with dogs (don’t tug on the doggo’s fluffy tail!). Aside from the effort required to satisfy their high activity level, these dogs are easy to care for because they groom themselves and rarely require baths. Don’t let their short legs fool you — the Basset Fauve de Bretagne is a noble breed from Brittany, a kingdom of France! This breed looks like a wire-coated Basset Hound, and their short legs help them hunt for rabbits and small game. Basset Fauve de Bretagnes are cheerful, friendly dogs that love to play in an open field. Watch out for their strong hunting instinct, though — they’ll want to chase after any small critters with their stumpy legs! This beautiful French dog is a renowned watchdog. The earliest mention of this breed dates back to 1578! 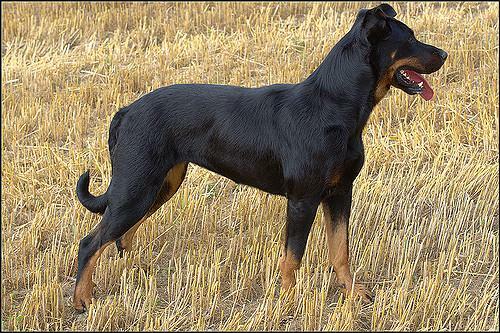 The Beauceron is a herding breed, used to herd sheep and cattle. Over time, this noble dog moved into police and military work as a mine detector, messenger, and trail finder. 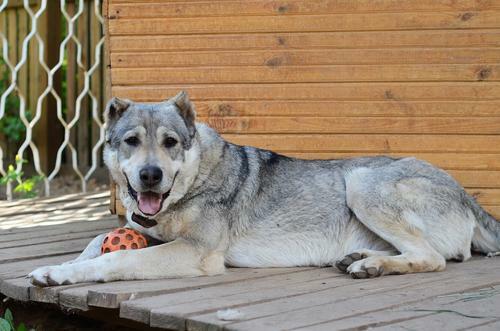 Beaucerons are independent and notoriously stubborn, so they need an experienced owner with great training skills. Give the Beauceron a job to do, new tricks to learn, and something to chew on, and they’ll be a happy camper! Known as an ancient dog breed, the Bergamasco Shepherd is at least 2,000 years old. This dog hails from the Alps, where their characteristic matted coats helped protect their eyes from the sun reflecting off mountain snow. The Bergamasco is an an intelligent, peaceful dog, and their natural patience make them a great fit for families with children. In fact, the Bergamasco Shepherd has been used as a therapy dog breed! The Biewer Terrier is a loyal, confident, and playful breed that hails from Germany. Originally called the Biewer Yorkshire Terrier a la Pom Pon, the very first Biewer Terrier was named Schneeflocken von Friedheck. This relatively new breed was recognized by the American Rare Breed Association in 2007. The Biewer Terrier isn’t known to bark, and they get along equally well with children and other dogs, making them a great choice for families. However, don’t leave this affectionate breed alone — they love spending time with people. 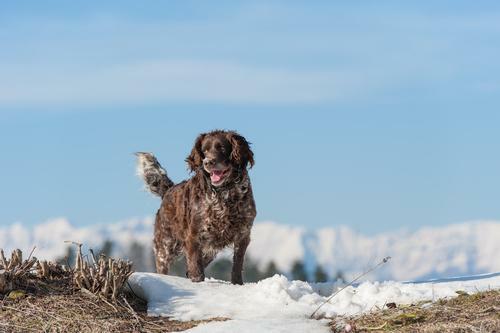 With a characteristic black and grey coat and thick, feathered ears, the Blue Picardy Spaniel is a historic spaniel breed that is mostly known in France and Canada. They originated from France in the early 1900s, descending from Picardy Spaniels and English Setters. The Blue Picardy Spaniel has impressive stamina due to their strong hunting heritage, so they require plenty of exercise and playtime. They are naturally obedient, quiet, and responsive to their beloved humans. 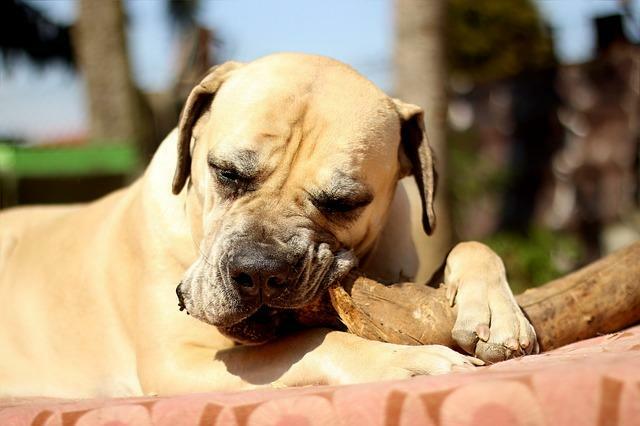 You might also know the Boerboel by their other name, the South African Mastiff! As their name implies, this large breed hails from South Africa, where they were bred as guard dogs. The breed remains popular in South Africa today, where they are bred and exported to other parts of the world. Boerboels are large, powerful dogs — which are necessary traits in order to defend their homes against large African lions! These dogs are intelligent, energetic, and love to be by their owner’s side. They thrive on companionship, training, and exercise. They may display aggression toward unfamiliar people and animals, so significant socialization and positive reinforcement is a necessity for this powerful doggo. 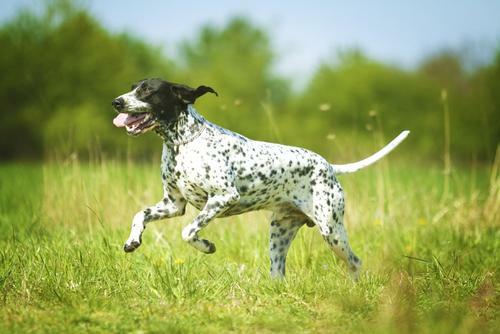 Also known as an Italian Pointer, the Bracco Italiano is recognized as an ancient breed, with native Italian roots that date back to fourth or fifth century BC. They’re primarily gun dogs, but they’re also known as people-loving pups that love to be around their family and other pets. Because they have a strong history as hunters, the Bracco Italiano needs physical and mental exercise in order to remain happy and healthy. Games that play off their hunting instincts, like fetch and hide-and-seek, will keep a Bracco Italiano entertained and content. The delicately spotted Braque d’Auvergne originates from the historic Auvergne province of France. They’re affectionate, obedient dogs that were bred to hunt, so these pups love having plenty of exercise and consistent training to keep their minds occupied. This good-natured breed will get along well with other doggos, although owners should always take care to properly introduce new fur-friends. 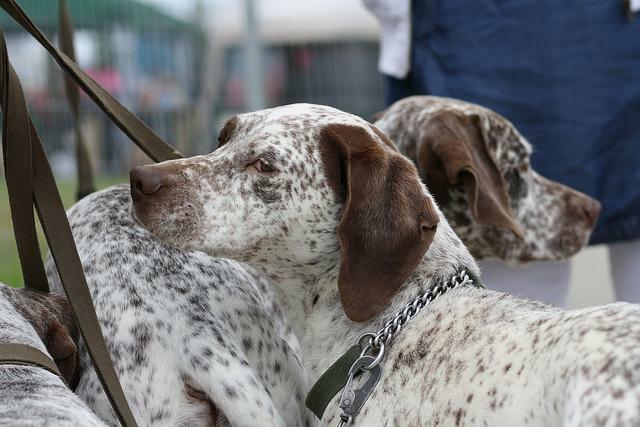 Also known as the Bourbonnais Pointer, this gundog is from the French province of Bourbonnais. The Braque du Bourbonnais first appeared during the Renaissance, when they were described as a pleasant hunting companion with a hardy, healthy appearance. They have two coat colors: liver or fawn. Their hunting background means that this breed needs plenty of mental and physical exercise. The Braque du Bourbonnais is an affectionate and intelligent dog who loves to go on adventures with their human! Regarded as a fast, nimble breed, the Briquet Griffon Vendeen is a hunting dog originating from France. They almost disappeared after World War II, but the breed was revived by French dog show judge Hubert Dezamy. Today, the breed remains rare in the US and France, but the Briquet Griffon Vendéen is renowned as an active, loyal dog with enough stamina to withstand a rigorous hunt. They are lively and occasionally stubborn, so they require a strong leader who provides them with an outlet for their exercise needs. Also known as the Canadian Inuit Dog, this happy floof is battling extinction: in 2008, only 300 purebred dogs remained. In fact, this breed is considered North America’s rarest and oldest indigenous domestic dog. Originally brought from Siberia over 1,000 years ago, Eskimo Dogs have a rich history as working transportation dogs in the Canadian Arctic. The Canadian Eskimo Dog is loyal, intelligent, and affectionate, thriving in cold environments. They require high-intensity exercise and mental stimulation, more so than other dog breeds, and they are highly trainable. They look like black Labrador Retrievers, but this dog hails from a small town in Portugal called Castro Laboreiro! You might know this breed by their other name, the Portuguese Cattle Dog or Portuguese Watch Dog. They likely appeared in the 19th century, when their ancestors defended herders from wolves and large predators. Today, the Cão De Castro Laboreiro is generally kept as a guard dog and family companion. They are brave, dominant dogs that may not get along well with other dogs, but they love children. This breed requires a large outdoor area to roam and a strong sense of leadership from their owner. The Catalonian Sheepdog hails from Catalonia, Spain, where they were bred for herding and companionship. In Spain, these dogs have been used as messengers, guard dogs, and police dogs! Also known as Catalan Sheepdogs, this breed remains rare today. However, they are agile, intelligent, and cheerful, making them excellent family dogs. Because of their herding background, Catalonian Sheepdogs require plenty of time outdoors for mental and physical exercise. This breed was the official mascot of the 1992 Olympics in Barcelona! Also called the Alabai, Central Asian Ovtcharka, and Aziat, this ancient dog breed first appeared in Central Asia approximately 4,000 years ago. The Central Asian Shepherd Dog is a diverse breed, containing numerous sizes, hair types, and colors, but one trait remains true across all Central Asian Shepherd Dogs: expressive, intelligent eyes. These large dogs have historically served as powerful livestock guardians, and today, they’re renowned guard dogs and working dogs. This breed is rarely seen outside of Central Asia, although they are starting to make an appearance in the US. Originating from Czechoslovakia in 1948, the first Cesky Terrier was a cross between a Sealyham Terrier and a Scottish Terrier. They were initially bred to hunt in the forests of Bohemia! 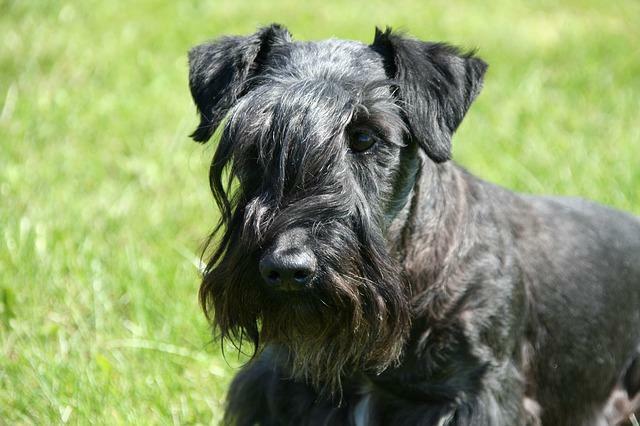 The Cesky Terrier is calm, quiet, and less active than other terrier breeds. Because they are loving and devoted, the Cesky is an excellent family and therapy dog. Also known as the Polish Greyhound, the Chart Polski is a lean, strong member of the Greyhound family. They were bred as hunting dogs in the early 1600s, and those strong hunting roots mean that Chart Polskis today may chase small animals. They are territorial and love to run, which means that Chart Polskis require plenty of space and exercise. This breed is not generally seen outside of Europe. The first Chinook dog was a cross between a farm dog and a Husky, born in New Hampshire in 1917. Bred as a sled dog, Chinooks are affectionate, athletic dogs that enjoy digging, going on runs, and spending time with their humans. They’re not aggressive or shy, and they’re smart, trainable dogs who enjoy having jobs to do and learning new tricks. Chinooks are large dogs that may occasionally display stubborn or boundary-testing behavior, so they require strong owners who can positively reinforce their new furry best friends. 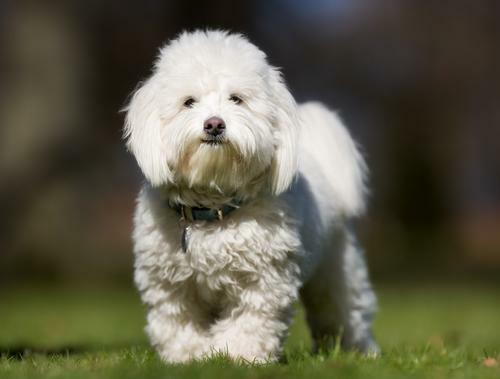 The Coton de Tulear is the national dog of their home nation, the island of Madagascar, where they were bred as companion dogs of the Merina tribe. They have characteristic cottony coats that match their gentle, playful personalities. The Coton doesn’t require a ton of exercise and doesn’t enjoy spending time alone. Consider this dog a Velcro breed that wants to be with their human all the time! Also known as the German Spaniel, the Deutscher Wachtelhund was bred as a hunting dog in Germany around 1890. The breed remains largely unknown outside of Germany, where they are largely kept as professional hunters and foresters rather than pets. The Deutscher Wachtelhund has a strong hunting instinct, and they can deftly hunt, retrieve, track, and trail a range of game in a variety of conditions. They’re friendly toward humans and other dogs and require plenty of exercise to stay happy and healthy. Did we miss your favorite rare dog breed? Let us know in the comments below! 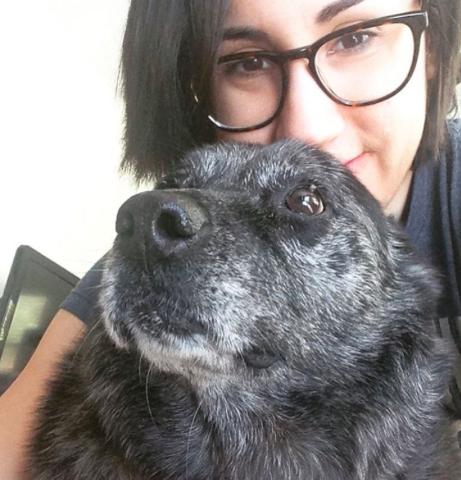 Science Says These Are The Best Pets. Do You Agree? Dog Friendly Beaches You And Your Pup Have To Visit This Summer!